KEYpak allows you to convert word processor, image and graphic documents from one format to another. Once KEYpak is installed on your system, you can convert multiple documents of mixed types (Word Processor, Image and Graphics) simultaneously. To see a list of conversion formats supported by KEYpak, refer to Appendix A. The following pages provide the step-by-step instructions to convert files in the Windows NT / XP environment. Invoke KEYpak. See Starting KEYpak from the On-line help. The KEYpak - Translation Utility application window will appear. Use the Options Menu to set up the format, path and extension for the converted files. See Options Menu from the On-line help. Select the directory which contains the source files that are to be converted. Once you click on a directory the files in that directory will be listed in the top right window. Select one or more files from this top right window for conversion. All selected files will be displayed in the lower right window. This lower right window will display the file name, the format of the source file, and the format for the converted file. If the source file format is not supported by KEYpak, it will be marked by an asterisk (*). Then select RUN from the File menu or Click the Toolbar Start Conversion button. This button or the RUN command in the File menu is not active until source files are selected from the top right window. Then number of documents selected for conversion will be displayed in the status bar. KEYpak will start converting the documents one at a time. 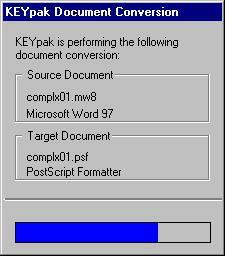 The KEYpak Document Conversion window will appear, which displays the name and format of the source and target document. After converting the selected files, KEYpak will display the number of converted files and ask whether you want to view the log file. The log file will contain any warning or error messages genertaed during the conversion process. If KEYpak lists any errors, you should view the log file to determine what types of errors occurred during conversion. Note: A log file is a temporary file. If you do not view when prompted to do so, it will be deleted. You might save a log file after viewing it.